Is there a way to estimate the lifetime of a SD card? If not, is there a utility I can use that monitors its integrity and reliability so I know when to use a new SD card? There are several tools that will check integrity of a filesystem, and recurring errors will point to a SD card reaching the end of its lifetime. Where x is the partition number. SanDisk SD cards have an endurance specification for each sector of 100,000 writes typical (reading a logical sector is unlimited). However, I do not know how many read/writes the typical OS uses on average. SD cards do the monitoring themselves, so you don't have to. Modern commercial-grade SD cards will use sophisticated wear leveling algorithms which detect and isolate bad blocks as they appear, so at any given moment no bad blocks are exposed to the file system. Things keep going until the SD card runs out of reserved spare blocks, at which point most cards permanently lock themselves to read-only mode. This is intended to give the user a chance to read out the data and move it to another medium. This is how you know you need to get a new one. Since the card typically runs out of spare blocks while you're writing on it, having journaling enabled greatly helps to recover your data. 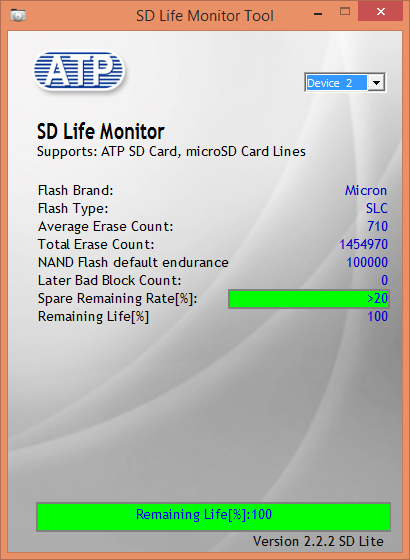 For ATP branded Industrial SD Cards, they provide "SD Lifetime Monitoring Tool" software for Linux/Windows. But if you use this tool you must run this tool from a Host Operating System. That means you can not use this software inside SD Card to check itself. Because if you run this software, SD card can not be accessable. mmcblk0p2 refers to the partition and has to be replaced by the partition to scan. You can list your partitions with lsblk or fdisk -l.
Bad blocks will be recorded to the log file. Unmounting of the file system is not necessary. You can also do non-destructive write tests (-n option), if you find it necessary. If you don't need to preserve the data you can also do faster (destructive) write test (-w option).